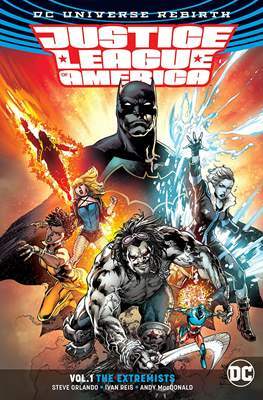 Written by rising star Steve Orlando (BATMAN, MIDNIGHTER) and illustrated by a league of superstar artists including Ivan Reis (GREEN LANTERN) and Andy MacDonald (DETECTIVE COMICS), this JUSTICE LEAGUE VS. SUICIDE SQUAD spin-off is a JLA for a whole new era--exploding from the pages of the blockbuster DC Rebirth event! The Justice League and the Suicide Squad—the World’s Greatest Heroes and its worst—went to war. A team unlike any other rose from the ashes. Batman had better be right, because Earth is about to be invaded by a threat from beyond our universe. The tyrant called Lord Havok and his army of Extremists are out to make the planet safe again—by destroying the free will of all its inhabitants. Can this untested new Justice League help America fend off the Extremists’ agenda? And can the Dark Knight contain the Main Man—the living weapon of mass destruction known as Lobo? Discover the answers in JUSTICE LEAGUE OF AMERICA VOL. 1: THE EXTREMISTS! Collects issues #1-6 and JUSTICE LEAGUE OF AMERICA: REBIRTH #1.